Insane 1 Minute Mayonnaise - watch what happens, it's crazy! Insane 1 minute mayonnaise – who doesn’t have 1 minute? Once you’ve made homemade 1 minute mayonnaise, trust me, you will never go back to store bought jars again. I just wish I had found a super simple mayonnaise recipe sooner. Scroll down to watch the quick video, and see the magic happen. NOTE :: Raw eggs are not recommended on those who are pregnant, have low immunity, children and the elderly. To avoid the risk you may be able to purchase pasteurised eggs or you can do this at home. Personally, my children and I have eaten raw eggs for years and never had a problem. We lick the batter from cakes before it is cooked, I eat soft boiled eggs and I like my scrambled eggs slightly undercooked. Raw eggs are found in Hollandaise sauce, mousse and some drinks. It is a risk I am willing to take, but a personal one. The choice whether to use raw eggs or not is completely and utterly up to you. If you have ever enjoyed the scrape out of cake batter, raw cookie dough or a chocolate mousse at a restaurant, you may have already unknowingly eaten raw egg. We eat A LOT of mayonnaise as a family and it’s always been something I have felt uncomfortable with because of the vegetable and seed oils they put into store bought mayonnaise. I have been meaning to develop a fail safe easy and super simple 1 minute mayonnaise recipe for simply ages. I urge you all to read my Ultimate Guide To Healthy Fats. It will explain what to use, what to avoid, and why. Even the store bought ‘whole egg mayonnaise ‘ contains only a small amount of egg and generally canola oil, soya oil, sunflower oil, rapeseed oil, corn oil or rice bran oil. You want to keep your vegetable and seed oils to an absolute minimum because vegetable/seed oils contain a high amount of omega 6 which is pro inflammatory, you should also try and increase your omega 3 intake, especially from oily fish, because these are anti inflammatory. Historically our omega 6:3 ratios used to be roughly 1:1, but are now up to 16:1 causing inflammation throughout the body. 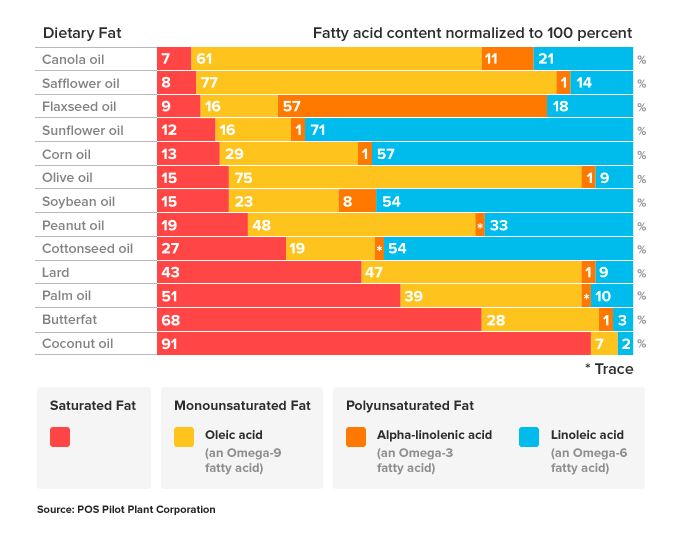 See the graph at the bottom of this post for omega ratios from dietary fats. 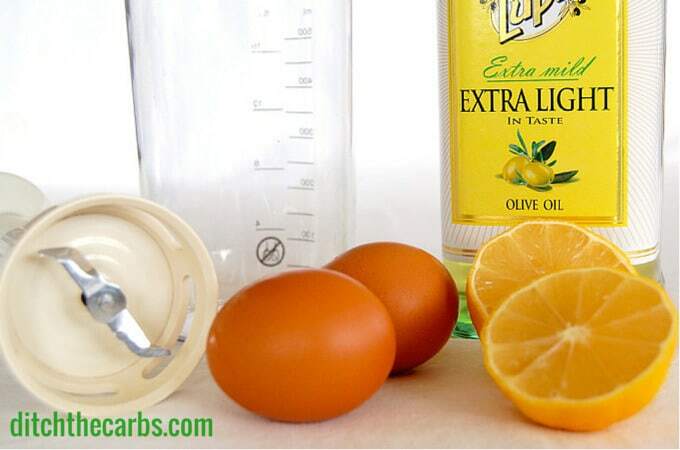 I have tried so many methods, ratios of oil to egg, lemon or no lemon. This is my perfected 1 minute mayonnaise. I have tried this method again and again and it has worked for me every single time. One readers testified that “even my five thumbed husband can make this successfully every time”. I also discovered you can’t use extra virgin olive oil because the taste is too strong, so I bought extra mild flavour olive oil. You can also successfully use macadamia oil or avocado oil which also has a neutral flavour but is very expensive. I store homemade 1 minute mayonnaise in the fridge for up to 3 days. If I have left the mayonnaise on the picnic table whilst having a bbq in the warm summer, then I will throw any remaining mayonnaise away at the end of that meal. If you are using raw unpasteurised eggs, use the freshest eggs, not the ones that are near their expiry date. Always make the mayonnaise fresh, then put it back in the fridge as soon as you have finished serving. Always store in the fridge and avoid warm temperatures for long periods of time. 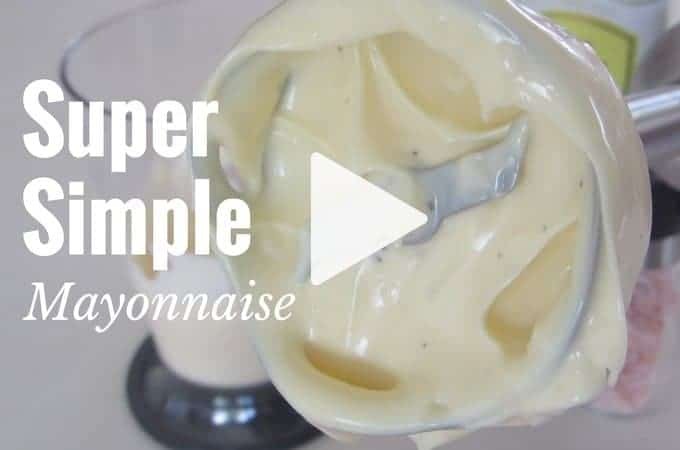 Follow the video exactly as it is shown to make the 1-minute mayonnaise recipe. Place the blender over the yolk in a tall slim jar. As you turn on the stick blender, bring the blades up slowly and emulsify the egg and the oil together until thick and creamy. Find a tall slim jar that your blade attachment of your stick/immersion blender fits into. Place the egg in the bottom of the jar. Pour in 1 cup of oil. Add the salt, pepper and any other seasonings on top. Place the blade attachment in the bottom of the jar and start blending until the egg and oil mixture is smooth, thick and pale. 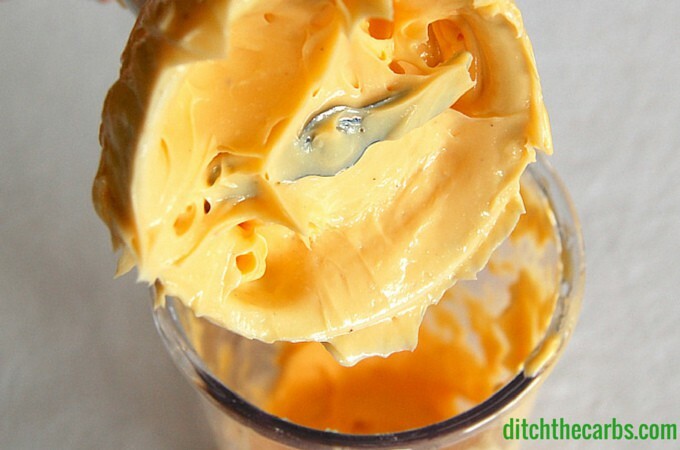 Add more or less oil depending on how thick you like your mayonnaise. * This is a versatile basic mayonnaise. See below for all the flavour options. 1 Minute Mayonnaise Flavour Options – add these flavours BEFORE processing. 1 Minute Mayonnaise Flavour Options – add these flavours AFTER processing. Tomato mayonnaise – 2 tbsp tomato paste. Perfect for prawn cocktails. Remember those? See where your omega 3, 6 and 9’s are coming from in your dietary fats. It says 6 servings but how much is a serving? 1 Tablespoon? 2? None of your videos show in Chrome, which is the only browser I have available on this chromebook. Hmmm, I am on Chrome and I can see them. I just tested an incognito window too, they still show. I’ll dig a little deeper to see what’s going on. Aw thanks, Terry. Glad you like all the variations. I am currently hooked on adding a huge amount of chopped fresh herbs from my garden – yum! Thank you for this! This is the fifth recipe for mayo I’ve tried and the only one that didn’t fail! Awesome!!! I even get my kids to make this for me while I’m getting dinner ready. It has to be my favourite sauce. I add herbs and spices to it too. Yes, I just made it five minutes ago with avocado oil and it worked perfectly! it only took about 15 seconds of blending with the stick, honestly. Try drizzling the oil in after mixing the other ingredients, instead of adding it at the beginning. Pinning for later..love all the variations. Sounds easy (which I really like LOL), and delicious. I’ve looked up & down this page 100x though, and can’t find the video. Watched another video on YouTube just to get the technique which I’ll use for this/these recipes! Thanks for sharing!! The video is right above the recipe. Sometimes things can be right in front of us and we still can’t spot them. I hope your mayo turned out well. The video does not show in Google Chrome but it does in Microsoft Edge ! Hi Libby, please can you help me with a couple of questions. I’ve made this mayo 3 or 4 times now and it has worked each time and so quick, easy and delicious. I would like to get it thick and spoonable as at the moment it is a creamy but fluid consistency. Please can you help? Also, a thought following on from a previos comment, can this be added to hot dishes to make the base for a creamy sauce …. so eg courgetti noodles sauce maybe? To ensure it thickens even more, you can use the stick blender for a little longer. If ZI ever want to make a creamy sauce, I simply add cream cheese (full fat) to the pan and deglaze to grab all the amazing juices, or stir through some courgetti. I have never tried to add the mayo, that might just work too! I get delicious salad dressing every time but not thick mayo. I use avocado oil. Oh my, worked first time and how easy was that and it tastes delicious. I did pasturize the egg first which was simple to do and having half a lemon over from lunch today, i added that to the egg and oil mix. Took on board the comments about using the high/fast setting on my immersion blender and hey presto. Such a great recipe. Thank you. Mine ended up as egg soup. I used my regular evoo, and it was not a good choice. I used my Kitchenaid immersion blender and ended up using 3 eggs. Your recipe states at the end to use more or less oil depending on the consistency you prefer, but doesn’t say which will give you the effect you want. I figured it out, but stood there confused for a few minutes, lol. What did I do wrong? What a shame. I really emphasise in the post to never use extra virgin olive oil, it is way too bitter for mayonnaise. I use the light flavoured version. It turns out creamy and yum. Did you place the stick blender in a tall jar over the egg yolk as shown? That is an absolute must. The choice of oil you use, is more for the flavour, not the thickness. You may add more oil at the end if it turns out too thick. Mine sometimes turns out like butter, I could almost spread it. I’m sure you will have more success next time. WHY does all the oil I have taste rancid ?? Maybe I need more seasoning ?? I would check the expiry date and where you store it. Oil should taste wonderful and fresh. Heat and sunlight can both make the oils go rancid, oxidised and horrid tasting. Do not store neat the oven or another heat source. Store I a cool dark place such as a pantry. Just a heads up: I tried this, using the low setting on my blender, and it was disgusting, just basically opaque oil. I decided I’d use it anyway as oil is expensive, and added a little more salt. This time I used the high setting on the blender, and, MAGIC! It fluffed right up and was the perfect consistency. Delicious, thank you. I do not have an immersion blender. I have Vitamiz and ninja attachments. Will those work instead? Hm, mine was watery, too. I took a fresh egg and added the liquid, then repeated with a third egg. That finally did the trick. Weird right? I used mct oil though, since it was the only neutral tasting oil I had in the house. I zlaays use macadamia oil … first tried it with evoo but it was too strong … maca oil is a very mild flavoured oil. I dont know what happened. I made this before and it worked perfectly, I also kept it in the fridge for a couple of months and I found the flavour became more mild. The olive oil had a very strong taste. I decided to make it again and put the egg in with some of the oil on top at first it immediately became like mayonnaise but as I dumped the rest of the oil in – it just became liquified. Did you use a tall slender jar as shown in the video? There is no need to “dump the rest of the oil in”. You place the egg in the tall jar, pour the oil and any seasoning. Place the head of the stick blender over the egg yolk. Turn the stick blender on and lift slowly so the egg and the oil emulsify gently. P.S. I keep my mayonnaise for up to 3 days in the fridge, keeping it in the fridge for a couple of months is not recommended. And if the olive oil had a strong taste, I wonder if you used the extra virgin olive oil, rather than the lighter tasting olive oil as shown? Use the high setting on your blender. Mine was liquidy and unappealing too. I decided to add more salt and used the high setting this time and it immediately fluffed up. Thank you! 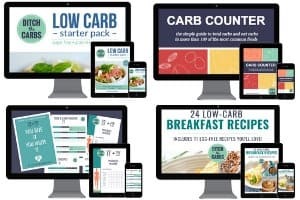 I am new to low carb/keto diet which is very different for me…plus I can’t eat dairy 😣. So, finding a simple, easy way to make a thick, creamy base I can use for so many things is amazing…fast and easy clean up,too! I allow my children to eat raw eggs all the time. They eat raw cookie dough, raw cake batter and yes, mayonnaise. This is the only pasteurised egg product I can find in NZ. They are more widely available in the US. Looks yum, I so need to try making this. currently use Sabato egg mayonnaise at $12 for a small jar. It’s made with olive oil. Hopefully I can successfully make this and save heaps of money. I love mayonnaise but don’t buy supermarket Mayo any more. This looks great! I think I will try using avocado oil. I’m very excited to try this! made this yesterday and holy molly it tastes like heaven. i used extra virgin olive oil (my brother in law grows olive trees and they make their own oil) coz that’s the only one i had (and use) so the oil had a strong taste (i even used half the amount you mentioned) but overall it’s excellent. i ain’t buying mayo anymore. i also used eggs from my mom’s chickens, it can’t get better(or more organic) than that. Hi Libby, I tried this recipe and it didn’t thicken and it was yellow. I feel I wasted a cup of olive oil and an egg. I didn’t raise the immersion blender, and thought it should have worked as in the video…. but no such luck. You must raise the immersion blender, that’s how it works, each and every time. Also in my notes above, if you ever have a failure, start again with one egg, then pour the failed mayo slowly into the egg AS you are blending it with the stick blender. There is always a way to save precious ingredients. I’m definitely going to try this (with some suggested additions). I’ve tried other mayo’s and have yet to find one that meets the taste of the store bought. I hated using a blender and dropping a few drops at a time! My concern though is the “light” olive oil. From what I’ve read about olive oils is that the light ones including the brand in your picture is not pure oil and has been lightened with some of the “undesirable” oils and I would like to get away from those. In that case, why bother trying to make it! 🙁 🙁 bummer….. I agree, all olive oils (especially the ‘lite tasting’ ones) need to be checked for authenticity. I wish I could have an up to date list for you to add here with all the varieties available and their “consumer guide” test results, wouldn’t that be useful? I can only be guided by the labels and only buy those which state 100% olive oil. What is the way to fix this (the eggs) for someone who is immune deficient? My husband had a transplant so we have no choices on the eggs not being raw. Can you use egg-beaters? I am not a ver good cook and need to ask this question. This is a great article on using pasteurised eggs. You can either buy eggs that have already been pasteurised or you can do it yourself. I have never used egg-beaters as we can’t buy it here, can anyone else comment if they have used it successfully? There’s not much you can do for an over-salted mayonnaise other than dilute the mayo with your choice of olive oil, avocado oil etc to dilute the salt. However, this would make the mayonnaise thin, more akin to a salad dressing. This method works like a charm! Fastest mayo I’ve ever made, thank you, Libby. 🙂 I did use evoo, because it was all I had, and you are correct about it tasting too strong. I figure it can be used over some steamed veggies or something else, but the next time I will definitely use an extra light oil. I don’t have a hand blender. Could I use my mixer for a bigger batch? This technique ONLY works with a stick blender. If you were to use a regular blender, you have to go back to the old way of drizzling the oil drop by drop into the blender chute onto the egg so it emulsifies incredibly slowly. How long can this stay in the fridge? I just tried to make this and although I blended it for what I thought was an appropriate amount of time, it is not thick at all. Can you tell me how long I need to blend before it becomes thick? I have blended for a few minutes and it’s still the consistency of a beverage. It should thicken almost immediately. Did you have a slim jar that just fitted the blade attachment? Did you place the stick blender over the egg as in the video? Did you bring up the stick blender slowly? Once you have done it successfully, it will seem second nature for it to work. If it ever fails to thicken, pour out the un-thickened mayo into a jug, pop a new egg back in the jar, then put the stick blender back on to pot the new egg and pour the failed runny mayo on top of the egg and blender slowly. Voila. Eggs and oil saved from the bin. God, you have the patience of a saint, Libby! I love this and have made my own mayonthis ways forever. How many servings do you get from your recipe? TIA!! The recipe makes about 300ml, I can’t give a serving size as some will use teaspoons, my family uses tablespoons (or more). Thank you for a brilliant recipe. I added a dash of white pepper, one level teaspoon of salt and one tablespoon of vinegar and it came out perfect. For any of your readers in the UK, I used Waitrose Essential light in colour olive oil and Sarsons distilled malt vinegar (the clear one – not the brown one you put on fish and chips!). This is the first time I’ve made mayonnaise that tasted better than Hellmann’s! I’m coming from 60+ years of eating Hellmann’s mayo. Libby, I love this recipe and will never go back to my first love (Hellmann’s), but I do miss that “bright” taste. I can’t put my finger on whot would add to this basic recipe to bring it up to that level, but if anyone has a suggestion, I’m open to it. In the meanwhile, I’ll consider/experiment with some of your flavor suggestions. Many, MANY thanks, Libby! Best Mayo recipe ever! And the background music gets me going! Can’t wait to try this! What could I add to make it taste like ranch dressing? You could add sour cream, chives, pepper, parsley, dill, garlic and onion. That would be incredible. Great recipe Libby! I was a bit nervous to try, but thought what’s the worst that can happen! Worked perfect, couldn’t believe it! I’m so excited to experiment with flavours. Thanks again for another great recipe. YAY. I try my best to teach everyone how super simple and healthy this is. SO many just cannot get past the fact it has raw eggs. Try it once, and you never go back to store bought. Add blue cheese at the end too, oh my word! Looks amazing ! I dont eat eggs…😝 Wish i could manage this one . …..
Hi Libby, I’m excited to try this. I’m in England so not sure how many millilitres are equivalent to a cup – could you give me a rough idea please? 240ml – 250ml is one cup. I only measure the oil for the video and the recipe, but in reality, I just throw it in and it still works. It doesn’t have to be too accurate. Thank you! I can’t believe how simple this looks. I am new to LCHF and can’t wait to try a whole stack of your recipes; thank you for making it so simple and appetising! Was so pleased with how well this recipe went that I decided I’m making my own mayo from now on, went to make a second batch today using the exact same ingredients, exact same method, hand blender, even the container I used was the same and it ended up like liquid. Almost as thin as water, even though I tried adding more oil. No idea what happened but I wasn’t about to waste all that lovely, expensive oil and I had no use for my broken mayo as salad dressing, so after some internet research, this is the method I used to salvage the mayo. For anyone who has their mayo fail on them, this worked brilliantly. Whip your broken mayo well (I use a hand blender), then add 2 teaspoons of boiling water and whip well again. Apparently in some cases this is enough to make the mayo come together, but that didn’t happen for me so I had to use the next step. Get a fresh container to make your mayo in and add an egg yolk, only the yolk this time. Start blending with your hand blender and drip your broken mayo into the new container a tiny bit at a time, whipping well after each addition. After a bit the mayo will start to thicken, keep adding, you can add a bit faster now. It should continue to thicken and as it does you can keep adding faster and faster until you’ve added all your broken mayo. It takes a lot longer and is not as simple a job but is a great back up to salvage your mayo. I also noted that there was less of the olive oil taste than the last time when I made this recipe but it still tasted good. Followed the directions to the letter and it did not emulsify at all. Just liquid. The only possible difference is that I used pasteurized eggs. But they looked completely like raw eggs, no whitening of the white at all. I have no idea what I did? I used olive oil extra virgin, but mine would not thicken? Stayed runny? Tried it with a stick blender and a nutri bullet? Did you add enough oil? It sounds weird, but the more you add the thicker it becomes. Did you immerse the stick blender onto the egg yolk as shown? Did you use mild olive oil? Let’s see if we can figure out what went wrong. I use this recipe probably 3 x week and it never ever fails. What a shame. At least you can call it salad dressing so you don’t waste it. Does it need to be a stick blender? I got rid of mine a couple years ago. Others have made this successfully with a bullet type blender or you can use a traditional food processor but you have to pour the oil in very slowly so it emulsifies completely. I tried this again with a different brand of olive oil and it turned out great this time! Can you suggest a good oil for general cooking, I currently use vegetable oil and I want to change. Olive oil does not have a high enough cooking temperature for general use. Thanks. There are different kinds of olive oil. Light olive oil can be cooked at higher temps. Coconut oil is good too. Olive oil and coconut oil are the only plant oils I have in my kitchen, along with butter and the occasional bacon fat when I make bacon. I don’t have a stick blender but have been thinking of getting one. What do you recommend and are there other recipes I could use it with? 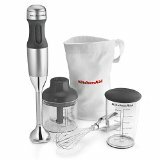 I wouldn’t be without my stick blender, take a look at this page with all my gadgets and items in my pantry. I use it for cheesecakes, mayonnaise, making almond meal from almonds when I run out, smoothies, cakes …. Love this. I just started using mayo when I started my keto journey in January. This recipe is easy and turned out perfectly! Thank you for sharing! I haven’t made this due to my concern about eating raw eggs. Does that not concern you? Nope! My children and I have been eating this for years, the French have eaten raw eggs forever and I’m sure everyone has licked the cake batter from the bowl before. If you have concerns you can buy pasteurised eggs now. I think when you say “whole egg” you mean “egg yolk”. I tried it three times and it wouldn’t thicken, until I drained off the egg-white first, and then it did thicken. No I really do mean a “whole egg” – the yolk and the white. If it doesn’t thicken, you may not have added enough oil. Strange as it may seem, the more oil you add, the thicker it becomes. I actually have to add a few drops of water sometimes if I overdo it. I finally got a mayo to emulsify!!! One question though – my Cuisinart stick blender (and consequently, the jar) got very HOT in the process. Is that OK? My stick blender motor gets hot but not the mayonnaise really. It should only take less than a minute to blend so not enough time to heat up. I guess it took me about 5 minutes; and that was only 1/2 cup of oil. I was scared to take any longer to do the whole cup. I guess I could add the oil more quickly? Thanks for the reply! Yes add the oil quicker. I slowly pour it in with one hand whilst using the stick blender with the other. All done in a minute, maybe less. Put the oil in the container, and add the egg. Wait until the egg sinks then add your lemon and seasoning if using. It will still make the same creamy texture. Very good stuff! I don’t count cholesterol, have a read of this page The Cholesterol Myth and see how important cholesterol is for our health. Eat plenty of healthy fats and low carb and that is a better predictor for heart health than cholesterol. Libby, which brand of olive oil are you using? I have tried making this with olive oil and macadamia nut oil and found both very strong and didn’t like them. We use a truck load of aioli in our house so this is something that I am keen to master. Maybe I just need to add the stevia as the current brand we use is probably quite sweet. Hi Kat, I use the Lupi Extra Light brand (referring to the taste not the fat content). It is the only one I have found to be mild enough to make a neutral mayonnaise. I’m always on the lookout for better ones as I understand the light flavour olive oils are more processed than I would like. You can also add salt, garlic or mustard to mask the taste of the stronger olive oils. What about avocado oil (although it’s very expensive) . I’ve shied away from mild olive oils because I understood they weren’t cold pressed and therefore probably no better for you than, say, rice bran (which is what I’ve used for years until reading that it wasn’t so healthy. I’ve certainly had no problems with stability and it’s kept at least a week in the fridge. I use a stick blender in an Easi-yo yoghurt jar, and have the convenience of the screen on lid for storage. They’re quite cheap to buy in the supermarket section that sells yoghurt mix. Avocado oils would be amazing, I generally reserve mine for drizzling on salads as you rightly say, are expensive. you can add whey to the mayo, leave on counter to culture and then it ll keep week n weeks in the fridge. i use 1 egg n 1 yolk i add mustard to help emulsify it also. i prefer vinegar also. Buy A Stick Blender if only just for this. it is incredibly worth it. the savings in jarred mayo, esp healthfood mayo, is significant. blenders and processors dont work n are a huge effort to clean out. i use a wide mouthed mason jar and just pop lid on once im dun stickblending it. think of all the flavorings you can easily add…minced garlic, parsley, ginger, horseradish … endless variations. Very timely for me as I have a truckload of whey left over from making ricotta. How much would you add to this recipe? Thanks for the tip! for 1 cup of oil, I’d add 2T whey and leave on counter 8 hrs to ferment. You let it sit after you’ve made it, correct? So we don’t need to be worried about the egg being uncooked…? I have eaten raw eggs for years and never had a problem. If you are concerned, choose eggs which are pasteurised. Or find someone who raises chickens and sells eggs. Check out how they raise them, what they feed them. Know who grows your food as much as you can! CAn walnut oil be used for the Mayo? I’m not sure. Does it have a strong walnut flavour? Give it a go and let us know. from my experience, doesn’t taste good. Macadamia oil is the best! Unless you use roasted walnut oil which is flavourful and taste great with sherry vinegar. But then it’s not raw any more if it concerns you. Walnut oil has more omega 6 fats than soybean oil does, so if you are making your own to avoid omega 6, walnut oil would defeat the purpose. I don’t have a stick blender. Can I use a food processor? Only if it can process small quantities. Mine is too big and would just flick the mayonnaise to the outside of the processor bowl so wouldn’t incorporate the oil as you drizzle it in. I have been making a variation of this for years – using another non-seed oil (rice-bran) as I find even the lightest olive oils add a flavour I don’t particularly want in most of my dishes using mayo). I don’t see it listed in your table and wonder about its properties vis-a-vis the other oils you’ve listed. Hi Di, I wouldn’t use rice bran oil as it is high in omega 6 and is unstable and liable to oxidation like the seed oils. Here is a great article covering the oils to avoid. Maybe hunt down a really mild olive oil, the one I use you can barely taste it (I know what you mean about the strong flavour) or maybe add some mustard or garlic to flavour it. I notice on the picture it says whole egg but the recipe only uses the yolk, can I use the whole egg? Yes you can. I’m about to amend the ingredients because I began with this recipe and have fine tuned it to just use 1 whole egg to make it super duper simple. Surely there is a mistake in the amount of salt required? I put in 1 tsp and had to chuck the whole thing out – shouldn’t it be 1 pinch? Could coconut oil be used instead of olive? Probably not. Because it has to be kept in the fridge the coconut oil would harden. I have used oil blends which included coconut oil which helped it ‘set up’ (yeah, sometimes it didn’t emulsify!) but MCT might work, eh? I have tried at least 10 different homemade mayo recipes and my two favorites were with bacon fat and with butter! Still, I just don’t LIKE the FLAVOR of homemade mayo. I know it’s healthier and EZ and I WANT to make it, use it and LIKE it. I hate using mayo with soybean oil from the store. UGH. Thanks for this. Any idea how long it will keep in the fridge?